Thank you to all our new subscribers and fans. Rosy loves you too for loving her style, grace, intelligence, wit and mostly for sharing our passion for South Africa. Going since 2005 ~ View some of our previous Newsletters here … and prior to those here. Please mail us on rosy@nosyrosy.co.za for Advertising or Website Design Quotes. the auspicious future of our Beautiful South Africa. Nosy Rosy’s character is inspired by every feisty, kind, strong, intelligent, humble, magnanimous, humour-in-hardship finding person, dead or alive. Yoko Ono just happened to be one of the very first to follow Nosy Rosy on Twitter. Rosy believes that there lives at least one intelligent and questioning cell in every brain, even under the most unlikely of circumstances. Some cells get bombarded with disinformation, mind altering substances (Champagne exempted) and negative minded people to such extreme levels, it almost loses all velocity and flexibility – at the worst -all life energy. We call that inertia or Stuckness. But there comes a time when every remotely sound mind will turn to question otherwise ‘accepted’ facts. As a young girl Rosy would relate what ‘other people’ were saying and her mother would whisper “Doubt darling. Doubt. Doubt everything. Then research with an open mind, find and live your own truth” Rosy never stopped believing in Goodness and the bold beauty & joy it brings. It is her aim to honour her mother’s wishes for her to be a strong independent mind by questioning the changeable for the better of all. Rosy’s inherent positive attitude, inquisitive nature and tongue in cheek questioning has inspired many cells out of its stuckness, and as we know, Positive Energy, like Love & Compassion, at work is a Divine force of Life, even – and especially – when it inspires a library visit, Wiki- or Google search for knowledge, a giggle or a helping hand. By 2005 most of the background research, writing and web structure planning reached a stage where it could go to publication and the first website www.infohermanus.co.za went live on 17 November 2005. 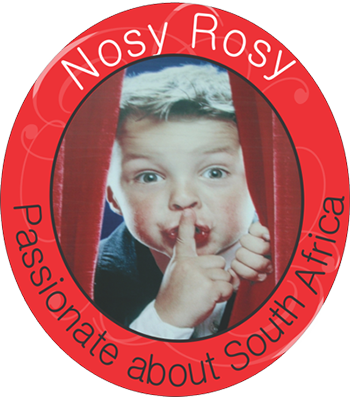 By popular demand the Domain www.nosyrosy.co.za was registered in 2010 to incorporate news, views and interestingness of all areas of our beloved South Africa. Nosy Rosy covers anything and everything she wishes to, across South Africa and the world. This approach has lead to an ever growing number of subscribers from all over the world as well as locally. who told his grandson this story. A Black one and a White one. Your whole life will be about the fight between these two. Why are they fighting Grandfather ? Because they are of opposing spirits. The Black wolf feeds on Anger and mistrust and self-hatred, violence and self-destruction and an eternal negative inner dialogue. The White wolf feeds on Love and Beauty, Joy, Forgiveness, Gratitude, Will-power, Courage, Trust and an eternal positive inner dialogue. Which one will win Grandfather? The one you feed most.